Major auto manufacturers know how to build things that move, but when one needed to keep their parts flowing we were honored that they turned to us for a solution. Split roller pallet flow racking is a terrific choice for this challenge but there are some key reasons why… so let’s go over the specs. 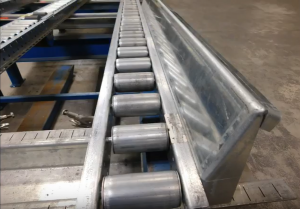 The parts are secured to 5 different length pallets of varying weights, but they do share a common structure and 45” width which helped for designing one system to handle all. 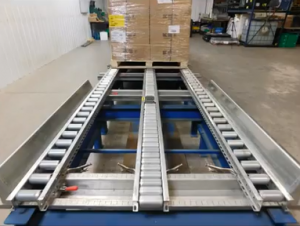 Each pallet has three bottom runners to make contact with the pallet flow lane, so we set up to test a 3-rail split roller design. We gathered the samples, engineering specs and off we went to the Mallard In-house pallet flow Testing Lab. 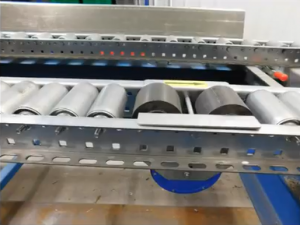 As you can see from the test video, the pallet flow lane is comprised of split-roller configured with 4” rollers on the outer rails and 2” rollers down the center. The outer rails are on 4” roller centers while the center lane runs tighter at 2”. A second important design feature are the drop-in speed controllers mounted in the center lane. They are set at 56” intervals to ensure they make consistent contact with the longer/heavier pallets. The shorter, lighter pallets come into contact with them less regularly so as not to slow them too much while still controlling the heavier pallets. The longer lane design of the 5, 7 and 8 deep are all benefitted from the speed controllers no matter which pallets are used on each. 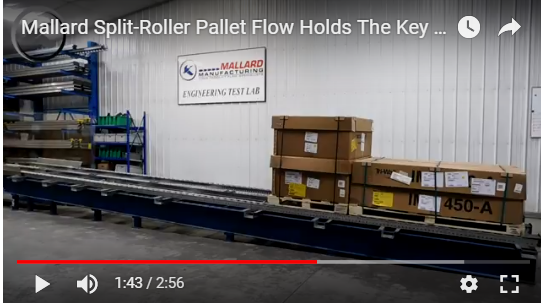 The Mallard engineers also highly recommended custom entry guides mounted closer to the flow rails to provide a tighter entry space and accommodate the precise placement of the 3¾” wide outer runners on the pallets onto the 4” outside rollers. This pallet flow racking accessory allows centering of the pallets thus keeping the center board in line with the center rail. Standard rack mounted guides could allow too much side to side movement preventing the speed controllers to stay centered and deflecting the bottom boards, potentially causing pallets to hang up. Now that we had built the lane… would it work? The video shows the engineers trying to make the pallets hang up on the initial descent, to no avail. Also, the pallets were left to sit in the lane overnight to see if they would hang up during the unloading process, but they started right up as front pallets were removed. Success! Can we agree… challenge met? We are always happy to provide a pallet flow solution for customers in need, so, what’s your need? Give us a call and we’ll get right on it.